Acupuncture is a system of medicine that has been practiced in China for thousands of years. It is a holistic or 'whole body' approach to maintaining health. It aims to treat the underlying cause of an illness rather than focusing on only alleviating symptoms. The fundamental principle underpinning traditional acupuncture is that there are two interactive qualities in nature called yin and yang, which interweave with each other both in the universe as a whole and within each individual. Good health depends on the maintenance of a balance between the two, and if this balance is disturbed the result is disease. In China, a whole regimen of diet, exercise, and other therapies is geared to balancing yin and yang. Acupuncture is a technique of inserting and manipulating needles into acupuncture points on the body to nourish and balance the Qi, helping to restore its smooth flow throughout the body. This can be highly effective in alleviating pain and promoting the healthy functioning of our bodies, minds and emotions. According to acupunctural teachings this will restore health and well-being. Acupuncture is thought to have originated in China and is most commonly associated with Traditional Chinese Medicine (TCM). In order to decide what alterations to make to the flow of qi, a traditional practitioner first takes a history, both of the patient and the problem, paying particular attention to the causes of disease that are considered important in this system examples include medical history, diet, emotions, way of life, the weather, and so on. Next come the two main diagnostic examinations: the appearance of the tongue and the character of the pulse at the wrist. On the basis of what the history and these examinations reveal, a decision is made about whether some of the points need stimulation or sedation, and this determines the course of treatment, which may either be by means of herbal medicine or acupuncture. If the latter, a number of needles are inserted into the appropriate acupuncture point or points and left in place for about 30min(sometimes longer),often being stimulated by hand. The number of points used and the length of time needles are left in place depend upon the desired effect. One common misconception about the theory of traditional acupuncture is that it is somehow mysterious, or even mystical. In fact, the concept is a rather mechanical one. An acupuncturist is thought of as a type of engineer, who regulates the flow of qi through the body by stimulating and reducing acupuncture points on the meridians. Nevertheless, the traditional system is holistic, in the sense that it takes into account a range of factors involving lifestyle, personality, and environmental influences that are not considered to be of such importance in modern medicine. Practitioners believe, by influencing qi, a life force that flows through the body in the blood vessels and also in a set of energetic pathways known as meridians(also yin and yang), which link the various organs of the body. Traditionally, the Chinese recognize 12 internal organs, which generally have the same names as their Western counterparts (heart, liver, spleen and so on) although the functions that are ascribed to them are different to those that we would recognize. Numerous meridians are described in the traditional texts, but only 14 of them are important in practice-12 are paired and two are in the midline of the body. 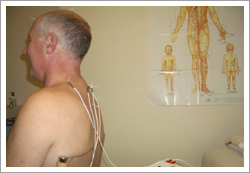 Situated mainly along the meridians are about 500 recognized acupuncture points, of which about 100 are commonly used. Generally, these are sites at which a meridian runs close to the surface of the body, which means that needles can be inserted in order to rebalance the flow of qi when it is disturbed. 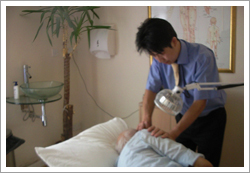 The World Health Organization(WHO) acknowledges Acupuncture as an effective treatment for a wide range of conditions. Please refer to the 'condition treated' page for further details. The stress of modern living can affect us physically, mentally and spiritually. This can lead to physical aches and pains, tension headaches, tiredness, irritability and a sense of dissatisfaction with life. Chinese Therapeutic Massage treats the whole person, recognising the connection between the mind, body and spirit and complementing the body's own healing ability. Essential oils extracted from the aromatic plants are used for their physical benefits, as well as their subtle effects on the mind and emotions. The use of Chinese herbs, like acupuncture, is one of the most important therapies, but it was largely unexplored outside China until this decade. There are over 300 Chinese herbs in common use. Chinese herbs can regulate the function of the internal organs and the immune system illnesses such as eczma and stress. Herbal treatment includes taking dry herbs as tea or powders and applying them externally. The beauty and science of using Chinese herbs is based on individual patient's clinical condition as diagnosed by a practitioner. Appropriate proportions and types of herbs will be prescribed. Reflexology is a science which is based on the principle that there are reflexes in the feet corresponding to each and every organ as well as all parts of the body. Stimulating these reflexes properly can alleviate many health problems in a natural and effective way. Reflexology is recognised by medical practitioners as a natural, beneficial and alternative. Acupuncture for fertility and reproduction can prepare the body for conception and pregnancy. It's a valuable part of a pre-conception programme and can benefit both partners. It can be used throughout natural and assisted pregnancy procedures, and as an ongoing support therapy.